Let's free download Windows 10 (32/64 bit) full version for experiencing amazing new features of this best Microsoft Windows system ever. 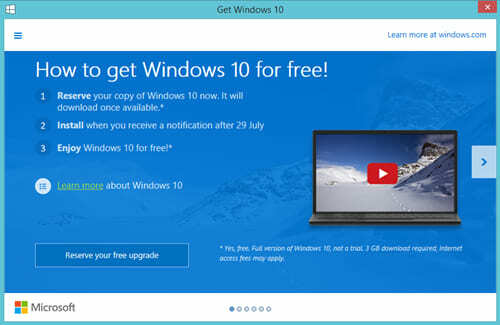 Microsoft Windows 10 full version was released on July 29, 2015 from when you can purchase Windows 10 or free upgrade from Windows 7 or Windows 8.1 for PC and tablet. Along with this good news, another concerned question appears. Can we free download Windows 10 full version? Where and how to download Windows 10 full version? Read this article and all questions will be answered. Notice: 1 year free upgrade from Windows 7/8 to Windows 10 expired on July 29, 2016. Tip: According to Windows 10 specifications, DVDs cannot be played on Windows 10 directly due to removal of Media Center and an alternative way of DVD playback is needed. WinX DVD Ripper Platinum, a great DVD ripper/converter enables you to rip/convert any (general and protected) DVDs to MP4, AVI, WMV, FLV etc, to help you watch DVD movies on Windows 10 without trouble. Windows 7/8.1 users are granted a free upgrade with reserving free copy of Windows 10 full version while the other Windows users or Mac/Linux users who want to swift to Windows are more likely to free download Windows 10 full version ISO online. First of all, you can read reviews of Windows 10 to learn performance, features and more about this new system to determine whether to download or not. If yes, you must have brief knowledge of system requirements for Windows 10 full version free download. Make sure that your devices are totally compatible with Windows 10 and follow the guides to free download Windows 10 full version. Any new and existing devices running on Windows 7 SP1 and Windows 8.1 Update, including desktop PC, laptop, tablet and Windows Phone 8.1 devices can free upgrade to Windows 10 for one year. Starting at June 1, a 'Get Windows 10' app for users to reserve Windows 10 popped up automatically at taskbar of qualified devices. With this app, the process of Windows 10 download and installation can be much easier. How to reserve Windows 10 free copy? Notice: You must running Windows 7 SP 1 or Windows 8.1 Update for this reservation. 1. If you have gotten a Windows icon of Get Windows 10 app at the bottom right corner of your screen, tap it to enter app Windows. If not, please install Windows update KB3035583 at first for having this app displayed at system tray and access it later. 2. Instruction of "How this free upgrade works" is shown in app Windows. You can read it to learn more details. Next, click Reserve your free upgrade button. 3. A valid email is required. Enter and confirm your email address. 4. When the upgrade is ready, Windows 10 full version files will be downloaded to PC automatically. Also, you will be notified to schedule the installation. In addition, the link to cancel reservation is offered in "Get Windows 10" app window for users to change the reservation at any time before installing. 1. Enter the keyword "free download Windows 10 full version" on Google and pick out the result which mostly accords with the search term. There are some possibilities. The result contents don't show what you want and your computer may be hacked or virus-infected if you click a risky page. 2. The software download sites are the best place where you can discover Windows full version ISO files (32/64 bit). Open a reliable site, for example Softonic. Input Windows 10 full version on search bar and tap Search button. You can directly download Windows 10 full version if you have found it in result list by tapping Download button or enter the program page to learn more (description, editor reviews) about it and click Download button on this page at last. 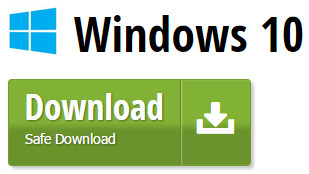 Notice: Some sites give different download links/buttons for Windows 10 32 bit and 64 bit. Confirm your system version and click the correct link/button to download. • Rip/Convert any homemade or commercial DVDs to MP4, AVI, WMV, etc, on Windows 10 with high-fidelity images and audio at a high speed. • Convert DVDs to Windows Phone (10/8.1/8), iPhone, iPad, Android, Surface Pro, Xbox, PS3/4 etc, for watching DVD movies on the move. • Copy DVD to ISO image, VIDEO_TS folder or backup full/main title to a single MPEG2 file for long-time storage. Best DVD Ripper for Windows 10 to Rip DVDs to MP4/AVI/WMV etc.